Apple's brand new AirPods have their virtues in that they are competitively priced, convenient, pack an impressive amount of technology, and deliver joyful tunes wirelessly. The gloomy side is that wearing them makes you look like as if you've stuffed your ears with broken electric toothbrush heads, and that losing them eventually is very much a given. With its simplistic new invention, Spigen has managed to solve both these problems. Seizing the opportunity, the popular accessories maker released the $10 AirPods Strap, which attaches to the pair of earbuds and neatly falls onto the wearer's neck. This way, if the AirPods were to slip away, they would simply dangle from the wire. It's an efficient design, familiar to that of regular Bluetooth headsets. There's also a convenient wire holder attachment that prevents the strap from tangling up. Of course, carrying the AirPods Strap will make those wireless earbuds a smidgen more wired than they used to be. But it won't make them any less practical, and in the end, that's what really counts. The AirPods Strap can be purchased from the source link below. Sooner or later Apple themselves will sell these 'stringed' together. Perhaps they left it up to 3rd parties for the time being in order to get more licensing revenue. If so, another brilliant business decision by the company in Cupertino. The next Apple Inc. innovation will be.. Iphone 8 plus & iphone 8 cannot be charged with the electricity at ur home. U need to buy apple i-current generator. You gotta protect that investment. Then it's loosing purpose of being wireless.. They should have gone one step further and included a lightning connector to charge them, because what would happen if you were to forget the 3.5 adapter or the little charging case those pods came in? Apple's idea of taking a step forward as a company translates into taking 3 steps back for the consumer, and the consumer is forced to take 2 steps forward only to end up no further ahead. That's the point, iWire sold separately for $50. Hah! 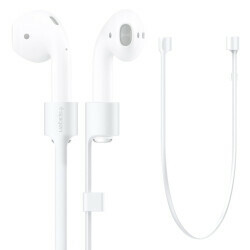 So much for "wireless" Looks like the Icon X design with no wires period, and wont fall out your ears design is better. That and it has features too. Terrible design. Not so well thought out. Form over function. This is cool. Wonder if some cheap eye glasses straps would work? I have some Bluetooth ear pods with wires just to the speakers. Wear like a necklace when not using. Excellent form. Hopefully Samsung have something for the Icon X. Cost to much to worry about losing.